The military plans to charge two intelligence soldiers in the suffocation death of an Iraqi general during an interrogation last fall, according to a newspaper report. Charges of negligent homicide and involuntary manslaughter will be filed against Chief Warrant Officers Lewis Welshofer and Jeff Williams, The Denver Post reported in Thursday editions, citing a Pentagon document obtained by the newspaper. Welshofer was not at home Thursday and his wife declined comment except to say he does have a military lawyer. Fort Carson spokesman Lt. Justin Journeay confirmed an investigation was under way but provided no details. Williams did not immediately return calls seeking comment Thursday. The Judge Advocate General's Office also did not return calls. Welshofer, a member of the 66th Military Intelligence Group, has said he did nothing wrong. He is accused of sitting on the chest of Iraqi Maj. Gen. Abed Hamed Mowhoush and covering his mouth while the air force commander was wrapped in a sleeping bag, according to the document. Mowhoush, 57, died during interrogation Nov. 26 at Qaim, Iraq. His death certificate lists homicide as the cause. The military has said Mowhoush died from asphyxiation due to smothering and chest compression. The CIA said one of its agents may also have been involved and referred the case to the Justice Department for investigation. Two other soldiers face dereliction-of-duty charges in the interrogation, the newspaper reported; they were not named in the Pentagon document. Welshofer and Williams were reprimanded by their commander earlier this year and were forbidden from conducting further interrogations, the Post reported. Scott Silliman, a Duke University law professor and former officer of the Judge Advocate General's Office, said he has never heard of a military officer being charged with homicide in the death of an inmate. "That's something unique to have a prison guard or interrogator, because of their physical action, to have caused the death of someone," he said. Other Fort Carson soldiers face possible discipline for forcing two Iraqi detainees to jump off a bridge into the Tigris River earlier this year. Members of the 3rd Armored Cavalry Regiment are also being questioned about the death of Iraqi prisoner Abdul Jaleel, 46, who died Jan. 9. The Army has said Jaleel died at a post near Al Asad of blunt force injuries and asphyxia. The mistreatment of Iraqi prisoners by U.S. troops has become a worldwide scandal, with the military and other agencies investigating a number of deaths as well as procedures at the Abu Ghraib prison. Seven members of the 372nd Military Police Company have been charged with mistreating prisoners. Several ongoing investigations seek to determine how far the responsibility for the abuses goes up the chain of command. Some of the scrutiny has been on the legal atmosphere created by policy proclamations at the White House, the Pentagon and the Justice Department. 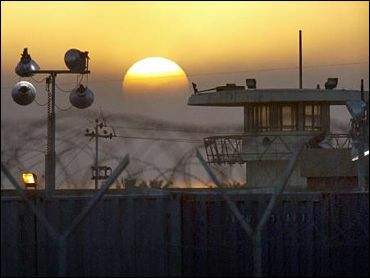 In an order less than four months after the Sept. 11, 2001, terrorist attacks, President Bush said the Geneva Conventions on treatment of prisoners did not apply to al Qaeda and Taliban suspects such as those imprisoned at Guantanamo Bay, Cuba. Mr. Bush ordered that all prisoners be treated humanely and, "to the extent appropriate and consistent with military necessity," in line with the "principles" of the Geneva Conventions. But at the same time he reserved the right to suspend the conventions "in this or future conflicts." Mr. Bush's order in February 2002 followed the advice of Justice Department lawyers who argued the conventions couldn't apply to an international terrorist group or militia members who did not follow the laws of war themselves. On the losing side of the argument was Secretary of State Colin Powell, who vigorously opposed carving out exceptions to the Geneva Conventions. Doing so, Powell wrote to the top White House lawyer in January 2002, "will reverse over a century of U.S. policy and practice in supporting the Geneva conventions and undermine the protections of the law of war for our troops, both in this specific conflict and in general." By the fall of 2002, military officers were seeking guidance on the president's order. Gen. James T. Hill, head of U.S. Southern Command, passed up the chain of command a list of dozens of interrogation techniques the military suggested for use at Guantanamo Bay. Defense Secretary Donald H. Rumsfeld approved some of the techniques on Dec. 2, 2002, but not death threats or another suggested method: putting wet towels over a prisoner's face and dripping water on those towels "to induce the misperception of suffocation." Rumsfeld did approve several techniques that are otherwise forbidden by U.S. military doctrine. Those used at Guantanamo included interrogating prisoners for up to 20 hours at a time and forcing prisoners to have their heads and beards shaved. The techniques Rumsfeld approved in November 2002 triggered objections from interrogators and military lawyers, reports CBS News Correspondent David Martin. Six weeks after giving the go-ahead, Rumsfeld abruptly canceled his approval. Rumsfeld formed a panel of top Defense Department officials to develop guidance on what interrogation techniques should be allowed. That panel concluded that international and U.S. laws against torture didn't apply to the prisoners at Guantanamo Bay, and it offered several defenses that interrogators could use if they were ever charged with crimes. The report also outlined several drawbacks to the harsher approaches, such as denting the military's image and causing bad publicity. Rumsfeld ended up approving only some of the panel's recommended interrogation techniques, choosing not to authorize actions such as sleep deprivation and keeping a prisoner naked. He allowed methods like "significantly increasing the fear level in a detainee" and "convincing the detainee that individuals from a country other than the United States are interrogating him." But he said all techniques must be "applied in a humane and lawful manner."